Get to see The Hague the way the King sees it. Feel the atmosphere and ambiance of days gone by in an original carriage. Each horse driven carriage has its own experienced coachman and footman both dressed in style, who will tell you all bout the King’s city of Residence. The trip goes part past the stately Lange Voorhout, Noordeinde Palace and the Denneweg with its antique shops and busy cafes, amongst other things. Every Thursday, in June, July and August, you can join this English spoken walking tour. At the Hofvijver is the Courtrea and the ancient village Die Haghe. Walk along the Binnenhof, where the counts had their homes. The guide leads you through the narrow streets of the old village with the medieval Big(Grote) Church at the Centre and the chic Voorhout with its city palaces. Let yourself be surprised by the stories about the beautiful city centre of the Hague! The walking tour starts at the Tourist Office The Hague at 1.30 PM, every Thursday in the period June until August. Stoom in Scheveningen is a new free event. During the event you can see, hear and smell working steam engines and enjoy short rides. Two steamers will also be anchored in the harbour, including the last steam-driven deep-sea tug Furie, made famous by the television series “Hollands Glorie”. Younger visitors can enjoy a ride on old miniature steam trains and tractors or jump around on the bouncy cushions. A party tent with new Hague music performances is set to make the event complete. Tong Tong Fair is the biggest Eurasian festival in the world, held every year in The Hague. The event is a pleasurable combination of a cultural festival, a fair and a culinary fest, in an archipelago of tents. Tong Tong Fair converts The Netherlands’ Dutch East Indies legacy into a kaleidoscopic cross-over of Eastern and Western performing arts, with a strongly international programme: the Tong Tong Festival. With hundreds of performances, the Tong Tong Festival offers the best mix of east and west in an broad programme filled with music, dance, literature and theatre. Many of the exhibitors at the Tong Tong Fair come all the way from Indonesia especially for the event; a growing number come from Vietnam and Malaysia. Smell the exotic spices, leaf through the pages of unusual cookery books, taste the sate kambing and listen to the peaceful sounds of the Javanese orchestra or the beautiful Kroncong music. So, if you don’t have the time or money to travel all the way to Southeast Asia, come to the Tong Tong Fair in The Hague and imagine that you are in the East. The Sand Sculpting World Championship will be held on Lange Voorhout in The Hague from 4 – 12 June 2018 as part of the 200 Years of Scheveningen Resort celebration. This is the first time that The Netherlands (The Hague) has hosted this unique world championship for sand sculpture, which is held once every 3 years. In total, it will include 9 large sand artworks of no less than 4 – 5 meters high. Each sculpture is created by top artists, selected by the World Sand Sculpting Academy WSSA. Each artist will create his own design, based on the central theme “200 years of sea, sand and …” Taking this central theme, the artists have maximum freedom to make a spectacular design and given the high creativity and inventiveness of the artists, each sculpture will tell its own story! The participating artists come from Japan, Singapore, the United States, Canada, Mexico, Ireland, Great Britain, Spain, Italy and the Czech Republic. Because the Netherlands is the host country, the Dutch participant will be excluded from the jury and 8 of the 9 sculptures will be judged by a professional jury. On 12 June, the professional jury will decide which sculpture is the best and which participant will be declared World Champion 2018. The creation of the sculptures by the artists will take place from Monday, June 4 until Tuesday, June 12. During this period, the public can watch the artists at work from 9 am to 5 pm. The competition will be officially closed on Tuesday 12 June at 2 pm. Judging will then follow and at 17.00 pm the new world champion will be announced. The sand artworks can then be viewed free of charge until 19 August 2018. Welcome to the most colourful city in the Netherlands! During this tour we will introduce you to the most versatile and colourful city in the Netherlands: The Hague! The Hague is the City of Peace and Law, the seat of government, Political Heart of the Netherlands, Embassy City, Festival City and the most beautiful Dutch seaside resort! The Hague also offers an oasis of green areas with fantastic parks, such as the Japanese Garden and the dunes with their gorgeous flora, fauna and sea vistas. The Hague is a city with a broad diversity of neighbourhoods: from the chic ‘Van Stolkpark’ to the ‘Schilderswijk’ as a beautiful colourful pallet. In the middle of the Schilders wijk is the The Hague Market or the ‘Haagse Markt’, one of Europe’s largest markets, four days a week the merchandise displays the multicultural composition of the Schilderswijk attracting large numbers of visitors. Chinatown: A piece of Asia in the centre of the Hague! Behind the Chinese Gates you can taste the atmosphere of the Asian restaurants, Chinese specialities, exotic products and numerous Chinese shops. B-Unlimited brings together writers, poets, thinkers and scientists from all over the world to discuss literature, art, science and society. Pleasant city tour with interesting facts and fables around Het Binnenhof. Why is the parliament not situated in Amsterdam?Anecdotes and stories around Het Binnenhof. Join the expedition and enjoy the beautiful places in the centre and near the Parliament. The guide will tell you various anecdotes, crazy, funny and strange events. Indeed, the parliament is in The Hague and not in our capital Amsterdam. There is a reason for it. And why was the government in 1885 not happy with the fountain on Het Binnenhof, a gift from the Hague inhabitants? The Anecdotetour gives you answers to these and other amusing and serious questions. Joy: the Asian street food festival takes place in Westbroek Park in The Hague and showcases Japanese food. A range of food trucks will be offering not just a variety of delicious sushi, but also a complete selection of other popular as well as less well known Asian street food staples, such as dim sum, sukiyaki, poké bowls, bao buns and ice cream rolls. In addition to delicious dishes and tantalising tastes, Joy will also stage entertainment with a Japanese twist: there will be a karaoke hotel, various sushi workshops, a games room, relaxing massages and a DJ to close the festival with musical flair. Your senses will be stimulated by the playful décor of Joy with its vibrant collection of cheery lamps, flickering neon lights and colourful Japanese umbrellas. The Hague turns PINK again and comes up with this two day festival aimed specifically at the GAY community and everyone who cares! On 8, 9 and 10 June 2018, Scheveningen will be dominated by culture, art, music and nature. The annual DuneArt event will take place around the Water Tower in the dunes of Scheveningen. Three days of free culture, viewing art, listening to music and walking in nature. The start year 2018, the year in which 200 years of Scheveningen Resort is celebrated, is an excellent moment to mark an annual event or new tradition. During the annual Bunkerdag the bunkers dotted along the Dutch coastline are opened to the general public for one day. From the Zuid-Hollandse islands up to Den Helder; there are more than fifty bunker sites, as well as other remnants of the Atlantic Wall to behold. Anime in The Hague is the oldest annual Japanese animation, film and culture festival of the Netherlands. Aside from the latest and greatest Anime from Japan, the festival features games, films, animations, TV series, music, manga (comic strips) and cosplay (costume making). The festival offers a game room with the latest console games, a dealer room with the latest goods, and several cultural events. The festival also focuses on more traditional culture, such as martial arts, go, shogi, Japanese food, sake, Japanese whisky and travel to Japan. The beautiful beach, sea and dunes surrounding Kijkduin are the main elements of the tough course of The Hague-Kijkduin Cross Triathlon Beach Challenge. It promises again to be a great sporting event! Athletes will face unique challenges on the course in the seaside resort of Kijkduin, with the ocean start known for its choppy surf, followed by bike and run trails on soft sand. Vlaggetjesdag (‘Flag Day’) is the event that heralds the arrival of the New Dutch herring year in, year out. Whether or not you are a fish enthusiast, Vlaggetjesdag in the port of Scheveningen offers something for everyone! Herring, corn wine, music, orchestras, artists, old sail lugers, miniature ships, presentations of all sorts of fish, boat trips… on Vlaggetjesdag both young and old will be overwhelmed. Take part in Old Dutch children’s games. Be amazed by well-known artists. Visit boats. Listen to the military tattoo. Watch old crafts. Visit old fire engines. Taste Scheveningen’s liquorice. And wind down on one of the many sun terraces. Sing along with the sea shanties. Anything goes on Vlaggetjesdag in The Hague! On Sunday 17 June 2018, as part of the Feest aan Zee festival, the Hague African Sankofa foundation is offering everyone a glimpse of Africa’s buzzing beach life. ‘The Hague African Beach’ promises to bring a splash of colour to the white beach around Alhoa Surf School in Scheveningen. It promises to be a feast for all the senses; music, dance, food, art, lifestyle, shows, tastings, African Braai and much, much more. Four scientists compete against each other in the ScienceBattle: who has the best story about his or her research? About the usefulness of tree frogs, historical diaries, philosophy of human rights and futuristic mini-organs. 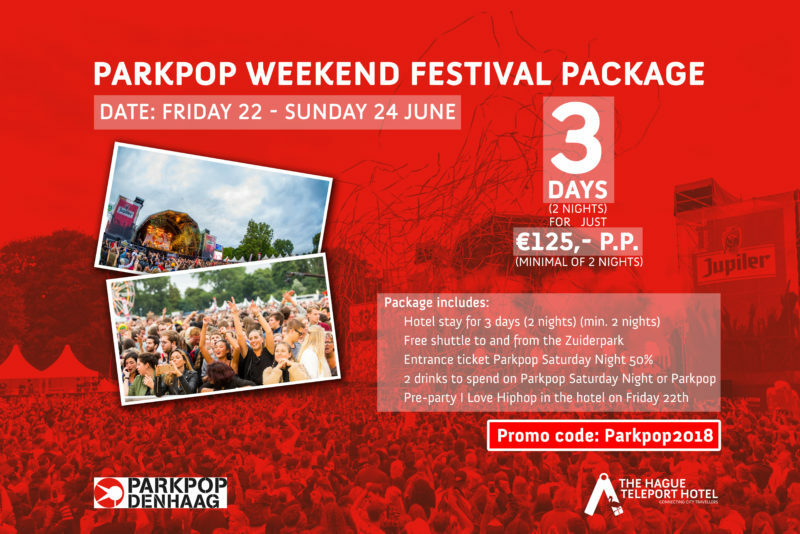 The city centre of The Hague will be transformed into one huge Parkpop pre party on the Friday night. Under the name Parkpop Downtown, a Parkpop labelled program will be performed, in collaboration with music venues such as De Zwarte Ruiter, Paard and September. Yoo! The I Love HipHop Festival 2018 is back in sight! This year the I Love HipHop Festival takes place from Wednesday, June 20 until Sunday, June 24. With the new house style and programming we will be even fresher this summer! The I Love HipHop Festival takes place at various locations in The Hague and includes breakdance battles, street art, live shows, comedy, film night, workshops and much more. Parkpop Saturday Night is a typical summer evening concert with national and international artists in the Hague Zuiderpark. The night before the intriguing Parkpop can enjoy casual with your friends comfortably on a mat under a tree in the South Park, or rather at the forefront of the action of your favorite artist while the sun slowly sets. That Night at the Park! A great evening with the best music in the pop music of the Netherlands, The Hague. 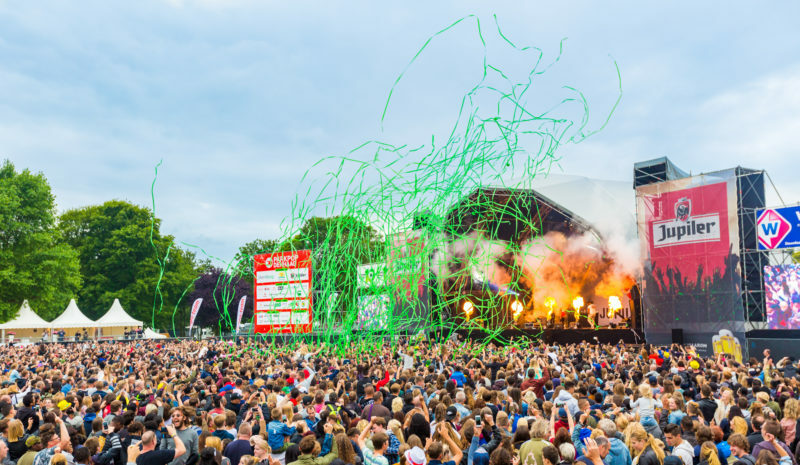 Parkpop is the largest free one-day pop festival in Europe offering two stages and attracting hundreds of thousands visitors. Lie back in the grass, beer in hand, listening to music… That is what Parkpop is all about! What begun more than 30 years ago as a small party in The Hague has blossomed into a huge one day pop festival. On the last Sunday in June, the South Park (Zuiderpark) is transformed into a music party with the biggest performers from home and abroad. This is a very special running experience, about 10 km and it takes you past and through some unique buildings. It’s a voyage of discovery that combines sport, culture and architecture. An Urban Trail is a running event, but it’s a bit different to ordinary runs. The Urban Trail concept focuses on the unique experience of a route through the city. There isn’t any competitive element, which means there aren’t any results either. The route takes you past (or even through) some unique urban locations, buildings and places of historical interest. It’s suitable for people of all ages and the focus is on experiencing an urban environment. And there’s a breakfast for all participants after the finish. A walhalla for lovers of a professionally brewed specialty beer: Chill out with a beer in your hand at the Grote Mark, a market square surrounded by bars and clubs. More than a dozen different spring beers from all over the country are tapped by the brewers themselves. The tasting is done from 15cl glasses. so you can properly judge the different brews. The glass costs 5 euros and you can take home after the festival as a souvenir or organize your own tasting at home. In addition, you can eat a lot of Dutch bites and enjoy the music. All the ingredients for a beautiful start of the spring! VISSCH is a culinary fish festival taking place every year in the harbour of The Hague’s beach resort Scheveningen. VISSCH invites you to try special sea dishes, like lobster burgers, oysters, exotic fishy delicacies and of course, Herring. During the festival you can learn how to fillet fish, enjoy being tugged along on a traditional Dutch fisherboat, or listen to the tall tales of the fishermen. The event also features workshops, demonstrations and performances by local pop bands and DJs. The festival location, with magnificent views of the harbour, the ships and the fish market, offers you a chance to experience the uniqueness of Scheveningen. Come see and taste the abundance of products the sea has to offer during food festival VISSCH! Bargain hunters and fashion lovers look forward to ShoppingNight in The Hague all year! The stores in the centre of The Hague will be open until midnight. Not only that, they will be offering big discounts, and the later it gets, the bigger the discounts! ShoppingNight is also just a really fun evening out, with fashion shows and different live acts throughout the city. In the city centre, the latest fashion trends will be paraded on the life-sized catwalk. On the catwalk major brands will be showcasing their latest collections, but exclusive items from small boutiques will feature too. On Veterans day in The Hague the past efforts of Dutch military personnel will be commemorated in various ways. And the efforts of military personnel now, who are engaged in peacekeeping operations in different parts of the world, will also be commemorated. Still think this isn’t enough? Then check out https://denhaag.com/en for even more!